Two similar treatments of relaxing face and body massage using a blend of grape seed and essential oils. A combination of neuro-muscular massage, acupressure and essential oils helps to re-balance the nervous system and induce a sense of well-being to mind, body and emotions. 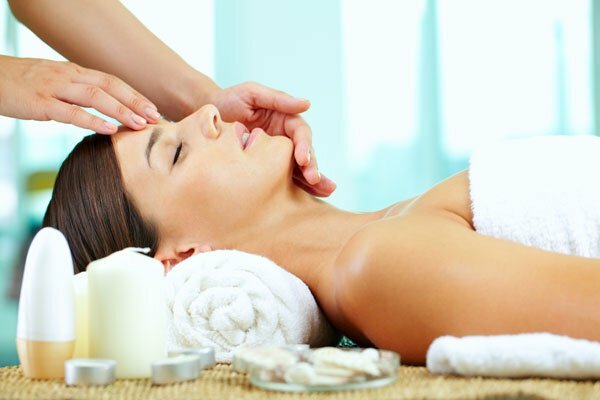 Most of this treatment involves massage to the head, neck, shoulders and back to re-balance the nervous system and to the face to ensure maximum effect of the essential oils as they are inhaled more readily. Massage to the arms and legs with reflexology to the feet completes the experience. With colour aromatherapy, a more detailed consultation will be carried out to reveal your personal therapeutic blend of essential oils with their unique colour vibration. Aromatherapy may help muscular tension, headaches, insomnia and other many stress-related conditions. 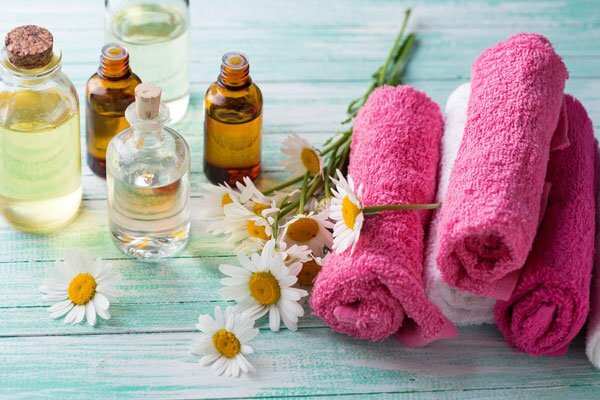 The term “aromatherapy” usually refers to an holistic treatment which includes massage in the form of neuro-muscular techniques, acupressure and essential oils. This helps to rebalance the nervous system and induce a sense of well-being to mind, body and emotions. Neuromuscular massage is a more precise massage of the muscles, tendons, ligaments and connective tissue helping to release tight areas of tension. It may include the craniosacral system, joints and internal organs. Acupressure is the gentle pressure of the thumb or fingertip to specific points on the face and body. This encourages the natural flow of Chi or vital energy through invisible channels known as Meridians. Chi is also affected by our lifestyle, especially sleep, stress levels, relaxation, diet, hydration and exercise. Essential oils are the “essence” of the flower, herb, resin or fruit and can have an instant effect upon our mood when inhaled. The molecules of an essential oil travel via the nose to the olfactory bulb and limbic system of the brain. The limbic system is involved with our sense of smell, memory, appetite and behaviour. Therefore essential oils can have quite profound effects on the body, mind and emotions as the limbic system is directly related to those areas of the brain controlling stress levels, heart rate, respiration, blood pressure and hormonal balance. The skin reflects the inner state of the body and is affected by diet, exercise, sleep, stress, medication, emotions and health in general. All essential oils are antiseptic and help to protect the skin from bacteria and pollution. They are readily absorbed and have cell-regenerating properties, encouraging healthy and youthful skin. They have proven effects of uplifting, calming and balancing the mind and emotions. Each essential oil has specific effects depending upon its natural chemical components. The vast range of essential oils are naturally made up of an array of vibrant colours. Colour and aroma are both forms of energetic healing and clearly indicate their properties. When knowledge of their properties is combined with awareness of colour, an even more accurate and effective blend is created. Bergamot (Citrus bergamia) uplifts the spirits due to its linalol (alcohol) content, acting as a tonic through its high percentage of limonene. It is useful during convalescence due to its restorative effects upon the nervous system. It can help with mood swings, especially when linked to the menstrual cycle or menopause as well as anxiety and depression. Bergamot has a green vibration connecting it to the heart chakra and is often used for grief and bereavement. Rose (Rosa centifolia) is high in the alcohols geraniol and nerol and like bergamot, geranium and jasmine it reduces stress by strengthening the parasympathetic nervous system. It increases vitality and promotes a sense of well-being. The deep pink vibration of rose opens the heart to feel compassion and is often used as an anti-depressant and to enhance femininity for infertility. Mandarin (Citrus reticulata) is high in refreshing esters and the monoterpene limonene. It is very beneficial in the treatment of insomnia, nervous tension and stress due to its calming and soothing effect. Mandarin has an orange/blue vibration and has a releasing affect on areas that feel stuck, being useful for the digestive and lymphatic systems. 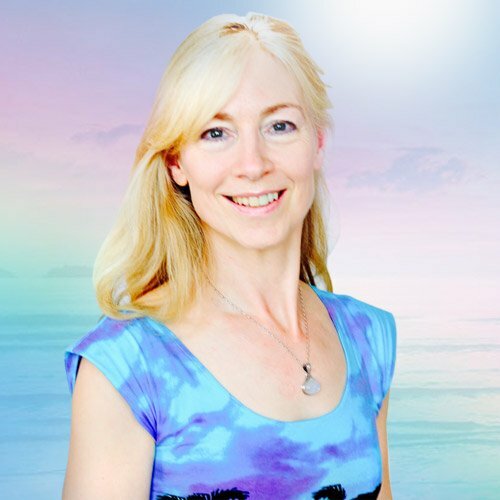 Jan trained in aromatherapy at Champneys College of Health and Beauty in 1982 with Geraldine Howard and furthered her studies ten years later gaining a diploma with Aromatherapy Associates in London of which Geraldine was co-founder in 1985. Aromatherapy Associates specialised in aromatherapy products and treatments, gaining worldwide presence. Jan owes her passion and love of aromatherapy to Geraldine who inspired her with her knowledge of essential oils and dedicated emotional support for her clients. During her career in paediatric nursing at St Mary’s Hospital, Paddington, Jan wrote an article entitled “The use of aromatherapy in hospitalised children with HIV disease” which was published in the Churchill Livingstone journal of Complementary Therapies in Nursing & Midwifery. She is very grateful to have the support of the Paediatric HIV team at St Mary’s with her work in complementary therapy. I met Jan when I took one of her Yoga classes and I was immediately taken by her compassionate nature and sensitive and healing touch. I find the regular massages I have with her to be very beneficial as a way to support my body with the physical and emotional discomfort I experience during my monthly hormonal cycle.